Rand Paul Splatters Letterman’s Ego Across Space-Time Continuum. Senator Rand Paul splattered Dave’s ego acoss the space-time continuum and it wasn’t pretty for the washed up late night liberal comic. 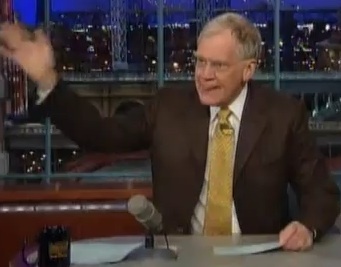 The other night Rand Paul was on Dave Letterman. I ceased to be a fan of Dave long ago, when he stopped being a cutting edge late night comedian and started allowing liberalism to turn him into a bitter crank. Why people still watch him going through the motions like a listless factory floor worker ready to die from repetition I’ll never know. Regardless, John Nolte still tunes in, as do millions of others every week, so it’s worth writing on when someone like Sen. Paul exposes Dave for the sad hack he’s become. “You want to always keep the public sector at a minimum because [it’s] inefficient. It’s not that government is inherently stupid — although that’s a debatable point — they don’t get the same signals. You and I get a signal–you have to pay your employees, you have to make a profit, you have to make earnings for the people who want to advertise with you. You’re forced to do something to give a product; the public sector doesn’t do that,” (Sen. Rand Paul). Like trained seals the liberal members of audience took to clapping for their master, which was odd considering that the only indicator he was giving them was that he was out of his league and should be left alone (presumably to the strange adultery lair above the CBS Studios once occupied by The Late Show interns). That didn’t happen, and since a kind soul never cut to a commercial Dave was left to continue the sparring match with Sen. Paul over education. Paul pointed out that Washington, DC spends roughly $20,000 per pupil, its education system is still abysmal, and that more money isn’t the answer. Dave’s response? Like any good liberal, the answer is always the money hose—the one that’s connected to the side of your house. And your brother’s house. And your sister’s house. And your next door neighbor who is trying to get a small business off the ground. Dave never stops to think that an ideology that views money as the primary driver to successful public policy might create perverse incentives in those tasked with making that success happen. After billions upon billions for (fill in your favorite liberal public policy disaster with a bad track record decades long), guys like Dave continue to say that if only there were more money allocated to the problem…everything would be all right. What makes Dave Letterman such an interesting case is that he’s so invested in his own ideology that even when faced with an argument he knows deep down is sound, he can’t recalibrate. When Dave says he’s stupid he may very well be telling the truth, because one way to identify an intelligent man is by presenting him with evidence contrary to his worldview and watching his adaptations. In light of Senator Paul’s adroit Government 101 presentation on The Late Show, all Dave could do was turn to the bald guy in the corner who’s paid to agree with him while dishing out snappy tunes. My guess is that Rand won’t be on for some time, if for no other reason than it will take Letterman’s ego (splattered across time and space) time to congeal and heal into a solid mass capable of dealing with the Freshman Senator. Previous Entry Lifting Weights: The Making of a Conservative. Next Entry X Men: First Class Reminds us All: The JFK Democrat is Gone. If only they didn’t let the marxist inspired part of their ideology (the bourgeoisie exploit the proletariat 100% of the time) and realized that tax cuts for business owners would benefit everybody, then the democrats could join the conservatives at the table of parties that want low taxes. If only they didn’t let the marxist inspired part of their ideology (the bourgeoisie exploit the proletariat 100% of the time) keep them from realizing that tax cuts for business owners would benefit everybody. Then democrats could join the republicans at the table of parties that want low taxes. I’d rather have some wealthy guy’s money sit in a bank then be wasted on “stimulus” projects that don’t stimulate anything. At least if it’s in the bank then it can be used by the bank to offer loans to innovators and entrepreneurs. By virtue of repetition liberals like fall back on the phrase ” tax the rich more” to solve fiscal problems. The question I like to ask in response to that is,why should government be given more of other peoples’ money to spend when they have proven so inept of using it in the interest of taxpayers? Government has been more apt to spend it on political motives compared to investors who spend their earned money for economic progress. Good point. If there was a “like” button for your comment I’d click it! “Bitter crank” pretty much sums the man up. His show has been a joyless affair for decades. If you want to see two different men who happen to the be the same man, watch an old clip of Dave when his show was actually a day-time show (where it started) and then watch a clip of his now. A rather sad evolution. It gives great pleasure to know that he was reduced, by his own Liberalism, to the mindless comments you mentioned.